OMG this tag is so ADORABLE! 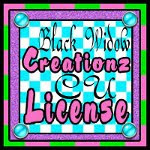 It was made using my kit Birds & Bees, which you can purchase at Twilight Scraps. Thank you so much Devious for making me this! Go check out her PSP tut using my kit HERE!